I get asked quite a bit how I label wires on boats and finally got around to an answer. I did not always use this technique, and over the years have tried lots of "solutions" before settling on a solution that both works for me and seems to last in the marine environment. I have tried everything from electrician specific tools, costing as much as $800.00 to the cheal Brother P-touches you'll see here. I have found that a simple Brother P-Touch label maker from Staples works wonders, providing you use the right tape. These label makers often go on-sale for $9.99 to $20.00. Even for the one pictured I paid just $19.99 plus the TZe tape. Using a P-Touch is not however without some tricks and techniques, which I will explain. In order to use a Brother P-Touch you will want to invest in their TZe label tapes shown in this image, Brother PN# TZe-231. they come in many colors but black letters on white tape (TZe-231) seems to work and is often the least expensive and most available. These days I use black labels with a white letters (TZe-335) but only out of personal preference. The inexpensive entry level label tapes will turn black when you put heat to them. Cheap label tapes can even turn black in a hot engine room. 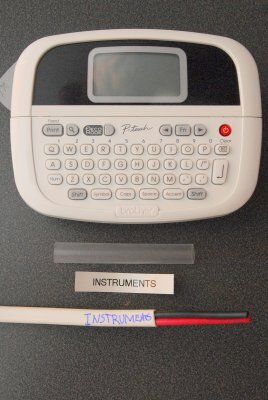 Avoid the lowest level tapes for wire labeling. The TZe tapes do not turn black when you heat shrink over them but, the cheaper label tapes do. The cheaper labels will turn black once you hit them with a heat gun but the TZe labels survive, provided you don't go over the top with your heat gun. For smaller individual wires, 16GA to 10GA, I also use the IDEAL #44-103 1 - 45 number kit. 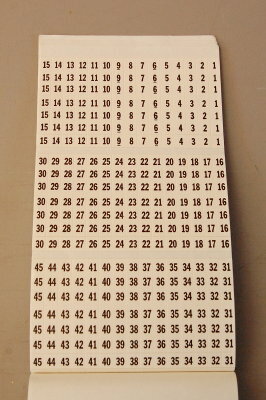 These are a cloth tape numbering system that only require one piece of "tape" rather than making your own double digit numbers with a 1- 9 numeric kit. They are also available in higher numbers if you need them. I buy the IDEAL #44-103 at Home Depot. 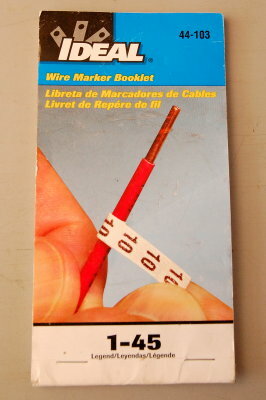 They are quite inexpensive and a single book will last you multiple wiring jobs. Without a diagram to go with the numbered labels it is only marginally better than no labeling at all.. 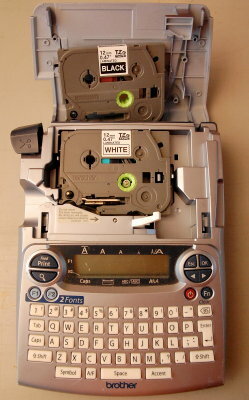 The TZe tapes also fit in the least expensive Brother P-Touch machines. This one cost just $9.99 at Staples. When I drop it and break it, and this happens, I feel much less of a wallet dent than dropping an $800.00 Rhino Commercial label maker. For marking duplex, triplex and battery cable I will often write on the jacket with a Sharpie marker first. This serves as a back up to the actual label. 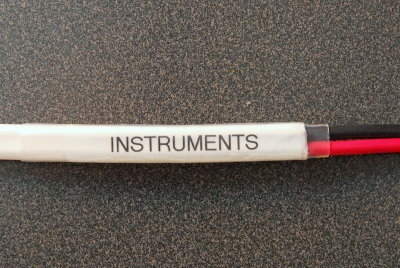 Here I've labeled the wire with the Sharpie, printed the P-Touch TZe label and cut the clear heat shrink. Here the P-Touch TZe label has been applied over the Sharpie writing. 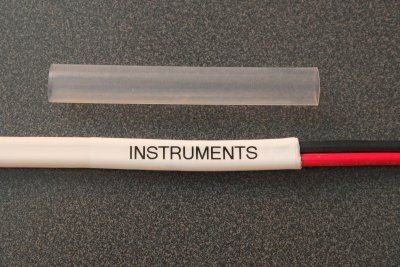 Next just slide on some clear non-adhesive lined heat shrink tubing. Be sure to cut the clear shrink a bit longer than the P-Touch label. 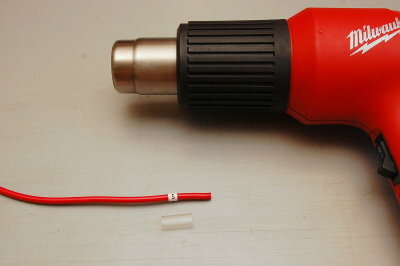 The last step is to shrink the clear tubing with a heat gun. Please DO-NOT use flame or over-heat the clear shrink. Applying more heat than is necessary serves no benefit. Just shrink it until it is tight and you;re done. For duplex wire (two wires in one jacket) in 12GA and 14GA I use 1/2" clear shrink (not adhesive lined). For larger battery cables I use 3/4" to 1". The application of the clear heat shrink over the label creates a label that is robust enough to survive in the marine environment. This is one of the only methods I've found that actually lasts and lo and behold it's also one of the least expensive.. It takes a little more time to do it this way but as you become proficient it moves along quickly. Over the years I have learned that my customers who are willing to pay for the labeling, want and prefer, the wires to be labeled in a common-sense fashion. I try to label so that even a novice with wires can understand it. This is not always easy but once you get a system it becomes easier. 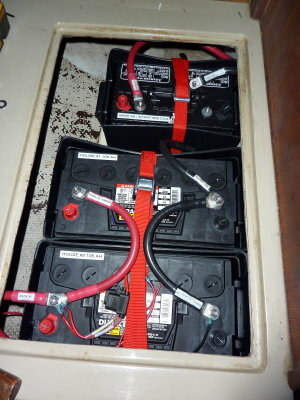 Common sense labeling on a boat means that each label is wired as "TO" or "FROM" and the device, load, panel, charger, panel etc. that corresponds with that wire. In this photos you can see how easy it is to determine what goes where and what comes from where. If you needed to find the in-line fuse for the Balmar Duo Charger it would take two seconds to find. For those of you who are marine electrical professionals, this also makes over the phone trouble shooting considerably easier when your customer has an issue in a far and distant location from where you are. These little details go a long way towards your customers overall satisfaction with you and your work, and may even turn into referrals. 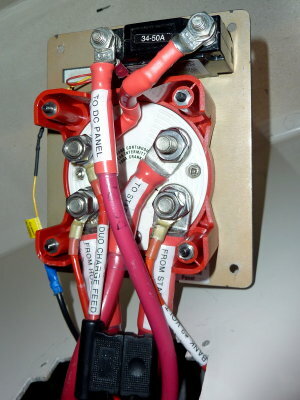 How many boaters know how to read a wiring diagram, electrical schematic or could even locate it on the boat? Diagrams are terrific but clear common-sense labeling also helps. I like common sense labeling, where it is appropriate. Even on a small battery system labeling makes sense. This owner can disconnect and re-connect his system very easily and knows where every wire goes.. 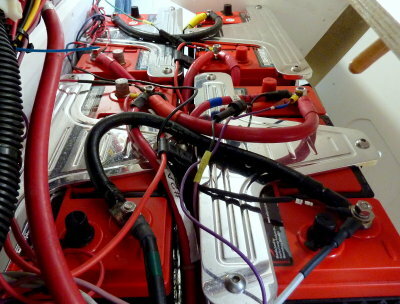 In this photo he has disconnected the banks for the winter, and removed any potential for parasitic loads, by removing the DC neg wires from the aft most battery. Even if he forgot where the wires went in the spring they are clearly labeled so reassembly is easy. Earlier I mentioned the IDEAL number packs. 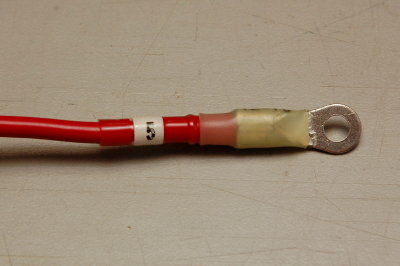 In this picture I have labeled this wire as #5. I've also cut a 1/2" length of 1/4" clear shrink that will be placed over the wire before crimping on the terminal. When labeling individual wires be sure to place the number far enough down the wire so that when you crimp on the terminal you have plenty of space. I usually crimp the terminal then slide the clear back up the wire and melt both the terminals heat shrink and the number shrink together. 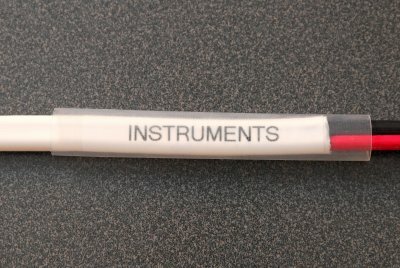 While the IDEAL numbers are fairly durable the addition of clear heat shrink takes it to the next level of durability. Some owners will be happy with just the numbers and some are willing to pay for the clear heat shrink step. For a DIY I would suggest going over the IDEAL numbers with clear shrink. Oh, oh spaghetti dinner.... Sometimes when I get a call to address sloppy wiring, the poor owner barely stands a chance to even properly disconnect the 12V system for winter. Note the P-Touch label about to fall off. This is why the clear shrink is key to using P-Touch labels. Do you know where any of these wires go? Neither did the owner!